Helen set up her now award winning jam company in 1998 as part of an alternative farm enterprise. The products are handmade, the old-fashioned way with just the saucepan and the wooden spoon and two key ingredients: top quality fruit and sugar. Cyril (Helen’s Husband) grows fruit on the family farm, Sandra (Helen’s Daughter) having just completed her Diploma in Food Speciality works in Production and Clive (Helen’s Son) runs the sales and marketing side of the business. Even in these recessionary times, sales are constantly increasing month on month. 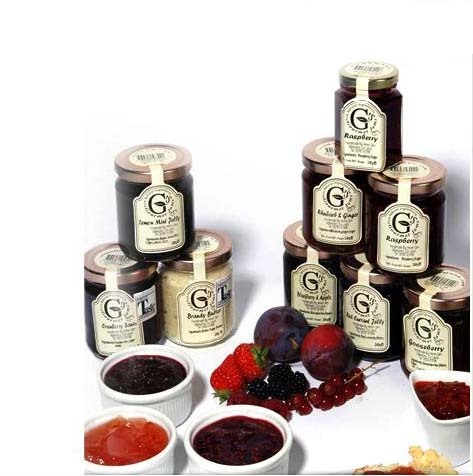 G’s Gourmet Jams supply their products nationwide to supermarkets, speciality food shops, hotels, restaurants, delis, butchers etc. The top 50 food and drink products were chosen from the 123 entries that had gained a coveted 3-star gold and each one has now been nominated for a Golden Fork Award, the highest accolade in fine food and drink which will be announced at the Awards’ dinner at London’s Royal Garden Hotel this September. To achieve a 3-star grading involves at least 25 experts unanimously agreeing that the product tastes divine. But to be included in the Top 50 Foods in Britain and Ireland meant each one had to satisfy the discerning palates of a further 25 dedicated foodies. These products all deliver the most extraordinary taste. Tuesday 22nd November 2011 Arun Kapil (right) of Green Saffron, the spice company based in Midleton, Co. Cork, has won the Entrepreneurial Award at Bord Bia’s Food and Drink Industry Awards 2011, taking place in Trinity College Dublin tonight. In 2007, Arun Kapil set up Green Saffron, a company which specialises in premium, farm-fresh whole spices and blends for use in home and professional kitchens. · Sustainability Award – Country Crest, a family owned business, situated in north County Dublin. As part of its environment philosophy, Country Crest includes a wind turbine, water recycling, and a wildlife pond. The company aims to be energy self-sufficient by 2015. · Branding Award – Largo Foods for Tayto, Ireland’s Number 1 crisp and snack brand and Ireland’s 5th largest grocery brand (Nielsen). Over 3 million bags of Tayto are sold in Ireland each week. · Entrepreneurial Award – Arun Kapil, Managing Director, Green Saffron. · Export Award – Jameson Over one billion glasses of Jameson are consumed around the world each year. Jameson is a global brand with a presence in over 120 markets. · Domestic Success Award – Flahavan’s Flahavan’s, one of Ireland’s leading private companies, has been milling quality Irish oats for over six generations. Kerrygold and Cashel Blue were also honoured with a Special Award in recognition of their co-branding, ‘co-opetition’ initiative in the US market. The Irish Dairy Board, owners of the Kerrygold brand, has recently joined forces with Cashel Blue in a new co-branding and distribution agreement to build brand awareness and market share in the US. Speaking at the event Aidan Cotter, Chief Executive, Bord Bia commented “this is an excellent example of co-opetition as a business strategy and how a large multinational exporter can collaborate with a niche player to develop a mutually beneficial brand offering. Kerrygold has added an artisan product to its portfolio while Cashel Blue is leveraging an established international brand with global distribution channels. It’s a win-win situation and we look forward to working with more companies on this exciting new model to develop our exports further.” Bord Bia is actively supporting the principle of co-opetition, where food companies work together to create synergies resulting in cost savings, improved returns and/or increased market distribution.